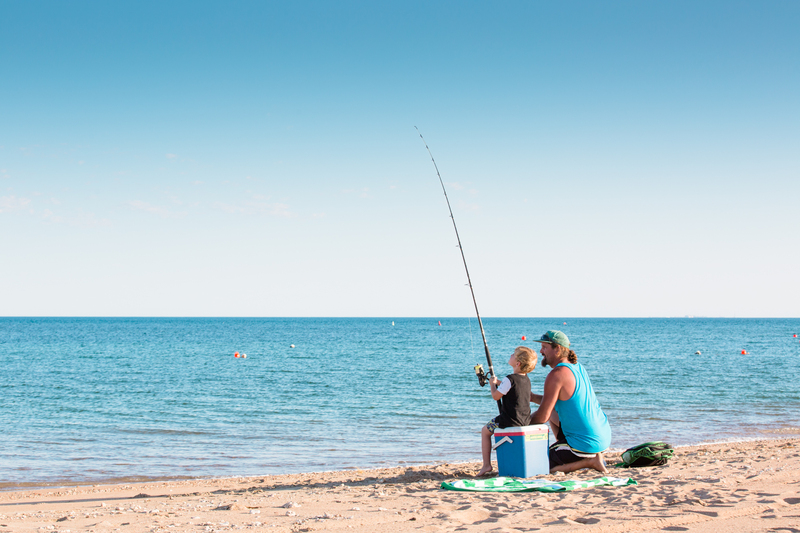 Feel the stresses of everyday life melt away when you try your hand at some relaxing beach fishing. Beautiful quiet beaches with deep channels, reefs and sand flats surround the Mackerel Islands, so your own secluded fishing spot is never far away and just waiting to be discovered. Whether you like to kick back with an ice cold drink, throw some bait out and wait for the fish to come to you, or wander the water’s edge casting poppers, stick baits and metal slices, whatever your mood, there’s a trove of spots to suit. On an incoming tide the fishing action really lights up with schools of fish coming to feed on shallow reefs. Casting lures at these times can result in some of the best fishing fun you can have! Wading out on the flats and sight casting for trevallies and queen fish is certainly an art, but there is nothing more rewarding than seeing a fish attack a lure in skinny waters. The islands are also home to cheeky schools of squid that can be caught darting between seagrass meadows – these guys are an easy catch and guaranteed to have the kids giggling and chasing for more!